Offspring of Cornus kousa 'Milky Way', a proven northern performer. Trial plantings have proven their hardiness rating equal to native species Cornus florida. 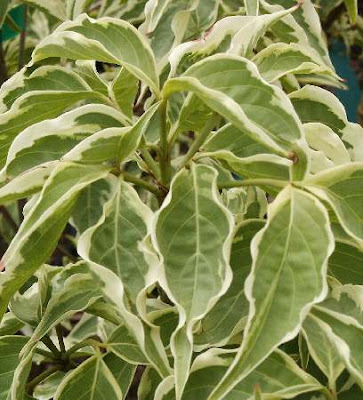 Attractive creamy-white and green variegated foliage is highlighted with rich pink hues in late summer and fall. Prolific bloomer in May and June, after the majority of spring flowering ornamentals have finished blooming. Ideal replacement for disease stricken native dogwood Cornus florida. A Care Free Maintenance™ tree, requiring little or no maintenance to maintain its natural form and beauty. Striking ornamental tree for featuring in commercial and residential landscapes. Understory tree in large naturalized plantings. Ideal alternate for Cornus florida and Cornus kousa and cultivars. Prefers moist, acidic, well drained soils with high organic content, pH 4.5-6.5. Best planted in the spring. Rate of Growth: Moderate, faster than species. Click here for current availability. Propagate by summer mist cuttings (root readily) or budding. Foliage does not scorch in the hot sun.